I often read the ‘In My Kitchen‘ posts hosted over at Fig Jam and Lime Cordial and am always impressed by the beauty in them. The sense of style, the creativity in food on display there is quite inspiring. I feel like such a clod in comparison! Well, clods like us have our uses too. I would like to own my useful cloddiness. For my 100th post (purely fortuitous, this) I looked around my kitchen and thought I’d talk about some of the gadgets, widgets, tools, thingamajigs, etc., that I found the most useful this month. But here is the catch. Clearly a post that goes something like — ‘The Fridge! it keeps things cool. The Stove for cooking’ — would get boring really fast. So the catch is that I want to talk about 10 things in my kitchen that I find tremendously useful in unintended ways. That is, in ways that the manufacturer did not intend. ONE. Oven light as yogurt maker: Here is a secret — you do not need a yogurt maker to make excellent yogurt at home. If your oven light works, leave yogurt to set all night in the oven with the light on. It shields from drafts and creates a gently toasty environment for the lacto-beasties to get to work. Here is more about the process. You can also use it to speed up the rise of your dough for bread. TWO. 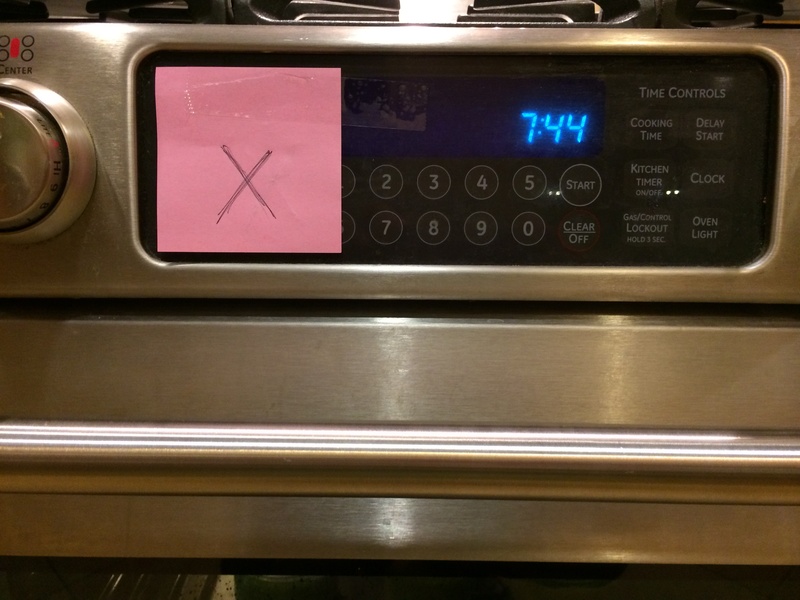 Oven timer for good parenting: Readers who are parents might concur that parenting is a lot about negotiation. I let you play for 5 minutes if you jump into the bath right after. Read a book for 15 minutes exactly, then it’s homework time. And so forth. I avoid endless arguments like — ‘that wasn’t ten minutes! That was just ONE minute!’ by using the kitchen timer on my oven. And this is how little my kid trusts me — she has to be the one to set the timer. The advantage of the oven timer is that it is at her face level and is easy to set and easy to read. And my, the beep is loud. Get into the bath, Now! THREE. Sushi serving platter as spoon rest: If you read this post of mine you might know that I scorn the wimpy spoon-rests one can buy at the store. The aspect ratio of the perfect spoon-rest in my mind is a wide and not very deep rectangle so several spoons can be rested on it on just their bowl parts. So I use sushi platters instead. They can be quite decorative. As is the one pictured, a birthday gift from my husband. FOUR. 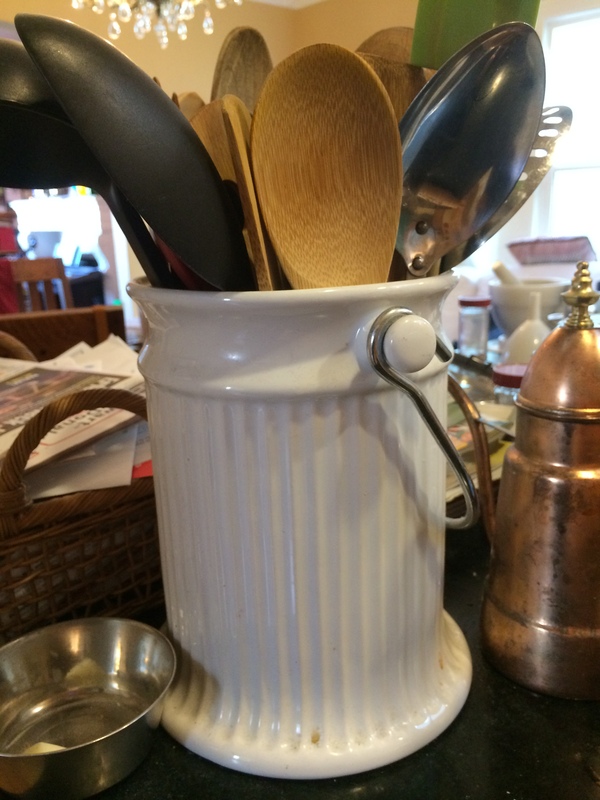 Compost pail as utensil holder: Speaking of wimpy…the usual utensil holders available from, say, William Sonoma, are completely inadequate for the number of spatulas, slotted spoons, wooden spoons, tongs and turners that I need near my stovetop. So I use one of those ceramic compost pails which really are a bit too decorative to consign to collecting rubbish anyway. FIVE. 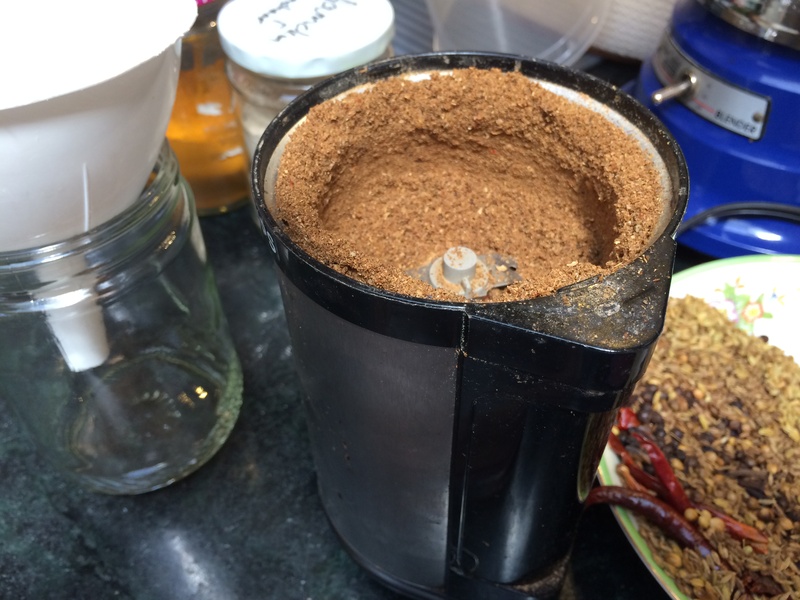 Coffee grinder as spice grinder: Buying pre-ground spices is a mug’s game because of their propensity to turn into cardboard (turmeric is an exception). One must have freshly-ground spices, but how?! The mortar and pestle is one option, but for a busy weeknight dinner one needs to unleash the grinding power of a thousand suns. In other words, the electrical coffee grinder. Except mine is always used for spices and is always situated on the counter. SIX. 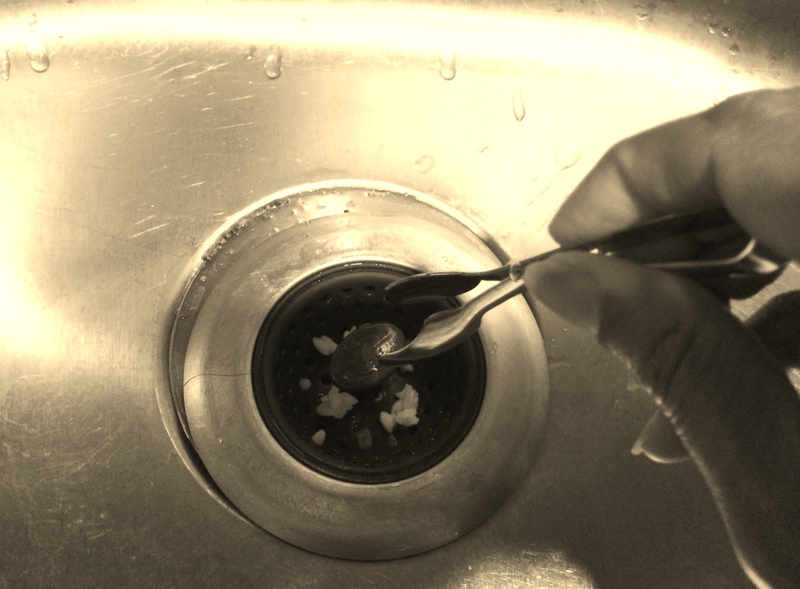 Lobster tongs to clean sink traps: My husband came home one day with these precious little lobster tongs that you pinch with forefinger and thumb to pry out whatever one pries out from lobsters. They are about 3 inches long. Given that we never make lobster at home, I thought it was an odd choice. But he knew they would be useful some day, he just didn’t know how. And they are! You know that gunk that seems to collect in sink traps that one is loath to touch, and yet pick out one must? Lobster tongs to the rescue. One has to only once draw out a long hair with gunk all over it and drop it in the bin with one of these to get how useful they are. SEVEN. Chopsticks as general purpose thingies: Chopsticks are some of the most useful devices known to man. Of course, I know that upwards of a billion people use it every day to eat their meals. But that’s not what I use them for. Instead, they are perfect for a number of kitchen tasks: pushing ground spices through a funnel; stirring flour and water in preparation for making the dough; making little ditches in soil for sowing your seeds. EIGHT. 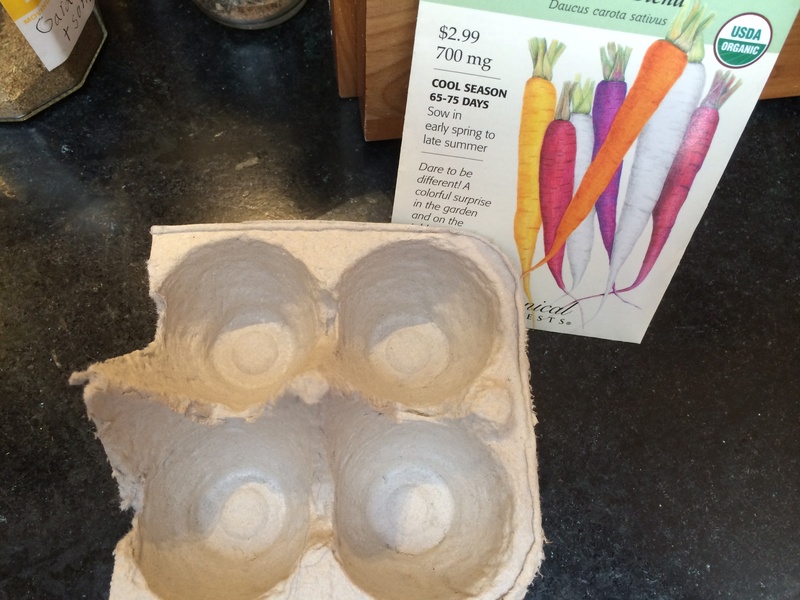 Egg-shell cartons for sprouting seeds: Purely aspirational, this one, but can I please enter it anyway? Please? This idea has been on my mind for years. Imagine neat rows of 12 egg carton ‘pots’ with soil placed in each scoop, and seeds sown in each. Then when it is time to plant, cut the scoops away from each other and the whole thing can go in the garden bed. No need to transplant. NINE. Coffee cone and filter for oil: There — you’ve done it again, you went and deep-fried something. Delicious, wasn’t it? And now what? Do you throw the oil away? No, you send it through a coffee cone with a coffee filter neatly placed in it, while the filtered oil drains into a jar. It will take hours, but you have time. The result is cleaned oil that you can use again and particulate gunk that you discard. TEN. Spouse as dish cleaner and lab rat: When I married one of these I could not have conceived of the many alternative uses it has. Its kitchen uses were certainly not on my mind at the time of the courtship. But it turns out, given that one is a cook, the spouse can make a great dish cleaner. Also, my kitchen being a bit of a lab, it sure is useful to have the spouse be the experimental animal. Great IMK post Aneela, good to have you join in. What would we do without the oven light. 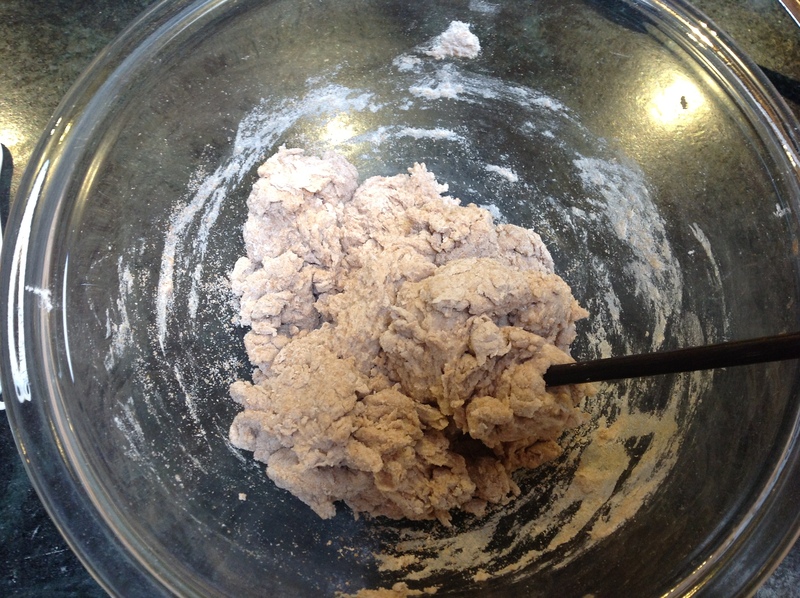 I prove my bread dough by this method, and use the loud and persistent oven time for all sorts of reminders. Just so long as long as the dishwasher has hands…….. The oven light is perfect. I call it my kitchen hot-house. Thanks Deena! And cluttered, but of course I wouldn’t put that on the interwebs! Yes to the chopsticks and the dishwasher/taste tester! 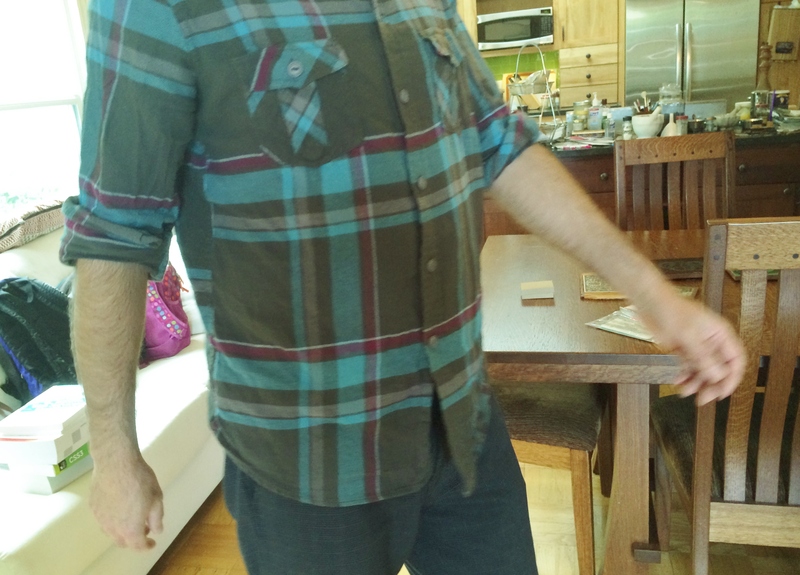 Congratulations on reaching your 100th blog post…..Great entry.. the picture of “Ed without a head” left me laughing. Thanks Deepthi. Hope that you don’t always remember him without a head! Love this, your first and one hundredth post, concurrently! Pilot light – genius; lobster thingies – more genius; oven timer – lifesaver when my son was small; spouse as dishwasher – priceless!!! 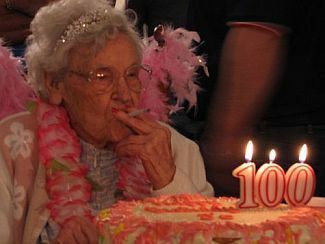 Congratulations on 100 posts Aneela and a fabulous, hysterical 1st IMK post! Thank you Selma! Yes it was a weird coincidence. Hope to do more of these. I hear you are hosting the Fiesta Friday but too much going on, can’t make that one! Have fun as I’m sure you will. It is perfect for yogurt, because to make yogurt one MUST have a warm environment, while you can get by with room temperature for bread dough. Depends on where you live in the world, of course. What a wonderful IMK post. I love how you use so many things for different purposes. Thank you for your wonderful idea and hosting space, Celia! And your global set of bloggers really lets me get a glimpse of different places. I hope to do more of these, IMK is such a simple idea and yet such a good one. I love your alternative uses, fab post! Made me smile lots – and I could completely see the sense in them too. The egg-timer gets used lots in parenting in this kitchen too. Thank you Andrea! Yes it’s all about the contract with the kids…. What a funny, funny post you’ve written Aneela! 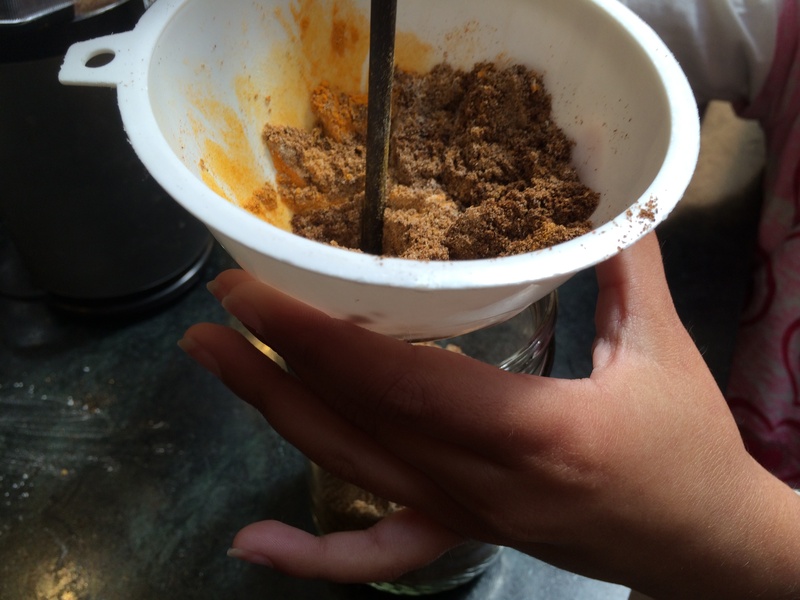 I use my coffee grinder for both coffee and spices and I use the coffee filter papers for lots of things too, Welcome to IMK and I can’t wait to read your next post. Thank you! I keep thinking of other things I make alternative uses of that I didn’t think to include. I guess we all do that. 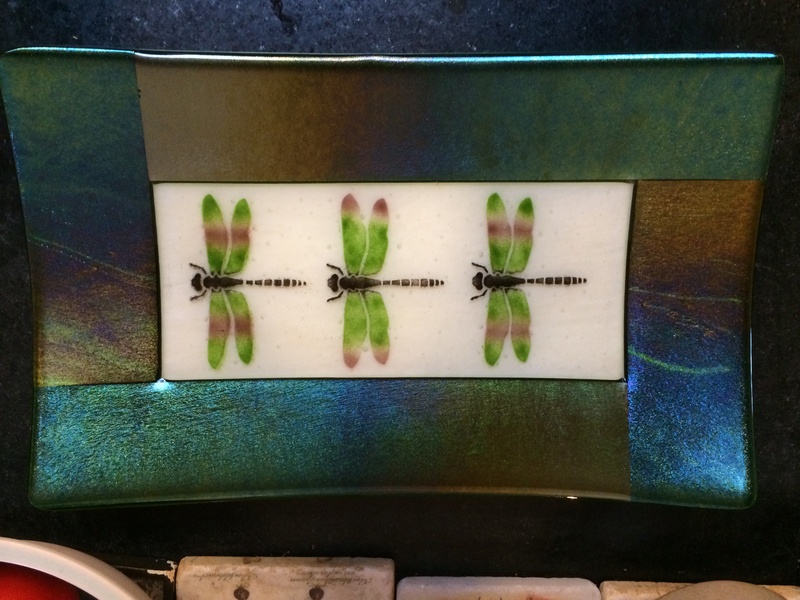 I do enjoy an IMK post with a difference and now I’m looking around my kitchen with new eyes! Sadly I no longer have a coffee grinder as my husband used it to grind dried beans from the field. It turns out that dried beans are harder than grinder blades. Lobster tongs look far more effective (and classy) than my bent wire coathanger. Thanks for the smiles…enjoyed your post! Ha thanks, I sugar-coated my experience somewhat with the last point. The lab rat does a lot of dishes but I do a lot too. That’s life for a cook. Aneela, your writing style and “alternate use theme” put the biggest smile on my face. Absolutely wonderful IMK post — nice to meet you! The kitchen timer was my best friend when my children were little, too, and I agree with you — utensil holders and spoon rests are too small. Loved your adaptations! Thank you Kim, great to have you visit! I’m having fun exploring your blog too.